Mold spores are everywhere – both indoors and outdoors, in the air and on many surfaces. Mold spores can enter your home through open doorways, windows, vents, heating, and air conditioning systems or attach to clothing, shoes, bags, and pets. 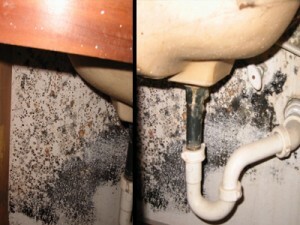 Where there is moisture, mold will grow: around leaks in roofs, windows, and pipes, or where there has been flooding. Mold grows well on paper products, cardboard, ceiling tiles, wood products, and can also grow in dust, paints, wallpaper, insulation, drywall, carpet, fabric and upholstery. Mold affects people differently, as some are more sensitive or allergic than others. Those sensitive to mold may experience nasal stuffiness, eye irritation, wheezing, or skin irritation. More severe reactions include fever and shortness of breath, and those with chronic lung illnesses may develop mold infections in their lungs. Mold exposure has also been linked to upper respiratory tract symptoms in otherwise healthy people. For information on mold inspection and removal please refer to the yellow pages.